A grandson's love for the letters his grandmother read to him led to Larimer's book. In 1961, 100 years after the start of the Civil War, Miriam Chase Larimer of Sioux City decided to write an article about her grandfather, Jacob Ritner, for Readers Digest Magazine. Ritner had served with the Iowa Infantry throughout the entire Civil War and, in a series of letters to his wife, Emeline, had shared his most intimate feelings and a graphic account of the war. While she worked on her article, her 8-year-old grandson, Charles Larimer, sat on the floor reading through the letters and making Civil War scrapbooks using clips from the Des Moines Register. Though his grandmother’s article was never published, Larimer’s love for the letters ensured the story eventually would be told. 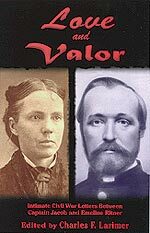 “Love and Valor: Intimate Civil War Letters Between Captain Jacob and Emeline Ritner ” is a moving Civil War story told through actual letters of both life on the front lines and life at home on an Iowa farm during one of our nation’s most brutal battles. Larimer, great great grandson of the Ritners and editor of the book, will sign copies at Book People on Thursday, July 19, and says there are many factors that set this book apart from others on the Civil War. Before responding to Abraham Lincoln’s first call to arms to enlist in the Union army, Jacob Ritner was an Iowa school teacher and farmer who lived near the town of Mt. Pleasant with his wife, Emeline, and their four children. While Jacob traveled and served under both Grant and Sherman early in their careers, Emeline stayed back to raise the children and attend the farm. Their letters to one another were detailed and articulate, their emotions evident. Emeline writes about raising the children, managing problems on the farm and in church, and offers a rare feminine view of an Iowa homefront deeply impacted by the ravages of war. The book also includes official regimental histories, newspaper articles and family correspondence. This article first appeared in the Weekender on July 19, 2001.